Bead Necklace offeredcan be made available by us in different design choices as well as in use of attractive color combinations that make them highly desired and demanded by the customers. Further, the exclusive finish of these necklaces also match up to the tastes of fashion and look conscious ladies. Some of its features include choice of different design combinations that adds to it flawless finish presentation; provides for highly aesthetic appearance; innovative and stylish range; available in different size choices to pick from; flawless finish that speak of exclusiveness. 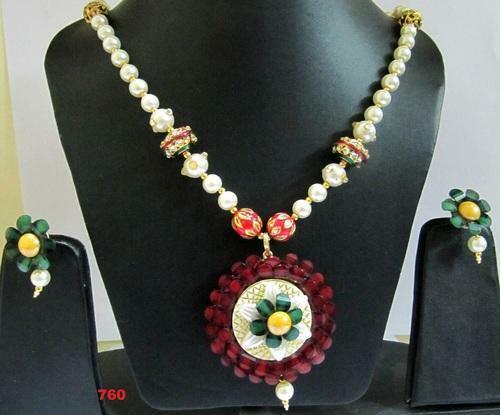 We are Specialized in making wide range of beaded necklace sets. We have vast number of different designs available. We keep introducing new designs everyday. Various color combinations are available in this . We use Multi color Stone beads . These are made by trained artisians. All are exclusive designs made by Shri Ambika Udyog. Please contact us for Bulk orders and Wholesale Pricing. Shri Ambika Udyog is one of the ISO 9001:2008 certified manufacturers, exporters, traders and suppliers of a comprehensive range of Gemstones, Beads and Jewellery Items, since 2001. Our product range comprises Milky White Diamond beads,Black Diamond Beads, Brown Diamond Beads, Blue Sapphire beads, Sapphire Cut Stone, Emerald Cut stone, Ruby Cut Stone, Emerald Beads, Ruby Beads, Red Spinel Beads,American Diamond Pendant, Fashion Jewellery, Beaded Stone Chains, Silver Stone Chains, Gold Stone Chains, Metal Chains, American Diamond Jewellery, American Diamond Necklace, AD Jewellery, Dyed Ruby Beads, Dyed Emerald Beads, Dyed Sapphire Beads, Tanzanite Beads and Cut,Cubic Zirconia Cut Stones, Cubic Zirconia Beads, Silver Jewellery, . Moreover, we offer Trendy Earrings, Stylish Earrings, Side Pendant Necklaces, Classical Bridal Set, AD Pearl Rings, Silver Pearl Rings and others. The stones are procured from some of the most reliable sources of the industry. Our range of precious & semi-precious stones is made available to the clients in varied sizes, finishes, colours and other specifications. These gemstones are used to embellish rings, necklaces, earrings, watches and others. The entire range of jewellery products is made using high quality gems, metals and others that are procured from the trusted vendors. Moreover, we follow latest fashion trends and clients' preferences while designing the jewellery offered by us. We have excellent command over the intricacies of jewellery designing and making. Our range of jewellery products are widely admired by the clients for its elegant yet trendy designs, fine finish, skin-friendliness, distinct ethnicity, flawless sheen and smooth edges. We also offer that facility of customization to meet the exact needs of the clients efficiently. Besides, our entire range of gemstones and jewellery is exported to various parts of the globe such as Indian Subcontinent, East Europe, East Asia, Central America, North Europe, Middle East, South America, South/West Europe, South East Asia and North America.